The global self-injection devices market is expanding at a rapid pace due to high prevalence and incidence rate of chronic diseases, technological advancements, new product development and commercialization, and product differentiation strategies adopted by leading pharmaceutical companies across the globe. In terms of revenue, the global market was valued at US$ 3,770.0 Mn in 2017. It is projected to reach US$ 11,380.9 Mn by 2026, expanding at a CAGR of 13.4% from 2018 to 2026. The global self-injection devices market is also driven by a significant rise in demand for home health care, owing to low cost of treatment and improvements in overall patient experience. Self-injection devices are designed for multiple injections of medicines and hormones for patients requiring frequent dosage for long-term management of medical conditions such as diabetes. Self-injection devices are available in both disposable and reusable forms. The ability of self-administration of drugs or medicines is a key factor fueling demand for pen injectors. The devices offer advantages such as fewer visits to hospitals or clinics, low cost, and ease of use. Self-injection devices are widely used for the administration of insulin to diabetic patients, administration of growth hormones, and administration of biologic drugs for the management of long lasting chronic disorders. 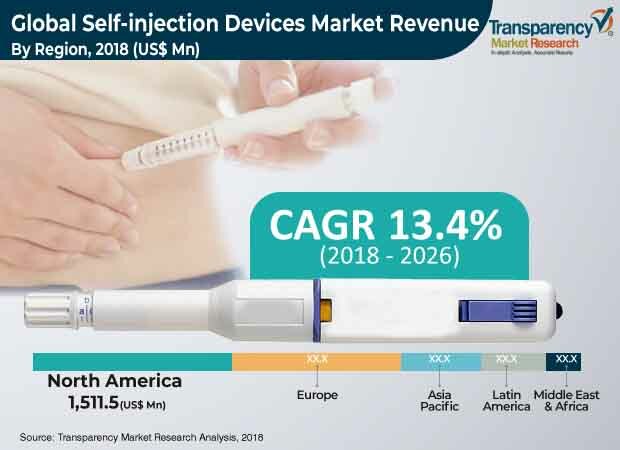 Extensive research and development activities by key players to develop self-injection products and rise in approvals of novel self-injection devices are anticipated to drive the global self-injection devices market. The global self-injection devices market is estimated to be driven by the high prevalence and incidence rates of chronic disorders, especially diabetes and rheumatoid arthritis, across the globe. For instance, according to the International Diabetes Federation, globally, the number of adults with diabetes (diagnosed or undiagnosed) is projected to increase from 415 million in 2016 to 642 million by 2040. Also, over 200 million people worldwide are estimated to be suffering from osteoporosis. The number of people aged 60 years and above worldwide is projected to increase from 901 million in 2015 to 2.1 billion by 2050. Therefore, the incidence of osteoporosis is expected to increase rapidly. Globally, over 14 million new cases of osteoporosis-related fractures are recorded every year. Technological advancements in self-injection devices, especially in autoinjectors and wearable injectors, for the administration of high viscosity and large volume drugs represents a potential business development opportunity for leading players operating in the market. Moreover, the patent expiry of leading biologic drugs and increase in demand for biosimilar drugs are expected to propel the self-injection devices market during the forecast period. In terms of product type, the global self-injection devices market has been segmented into pen injectors, autoinjectors, and wearable injectors. The pen injectors segment held a significant share of 67.6% of the market in 2017. Research indicates that it is likely to be the leading product segment, owing to the applications of pen injectors in diabetes, easy availability, and low cost. The abundant availability of these products is expected to boost the pen injectors segment during the forecast period. Reports also suggest that the wearable injectors segment is projected to expand at a CAGR of 20.0% between 2018 and 2026. In terms of region, the global self-injection devices market has been segmented into North America, Europe, Asia Pacific, Latin America, and Middle East & Africa. North America is expected to dominate the global market during the forecast period. The high volume of consumption of disposable self-injection devices, rapid increase in the population with diabetes and rheumatoid arthritis, and rise in home health care are expected to propel the market in North America in the coming years. Furthermore, patent expiry of leading biologic drugs in the U.S., rise in demand for biosimilars, and anticipated new product launches are likely to augment the growth of the self-injection devices market in the region. The market in Asia Pacific is projected to expand at a prominent CAGR during the forecast period. Increase in awareness about various chronic disorders, rapidly changing health care infrastructure in developing countries such as China and India, and well-established pharmaceutical market in Japan are anticipated to fuel the self-injection devices market in Asia Pacific during the forecast period. A majority of pharmaceutical companies have established strategic partnerships with medical device companies to differentiate their products and are coming up with self-injection devices to tap the home health care market. Key players operating in the global self-injection devices market include Becton, Dickinson and Company, Gerresheimer AG, Insulet Corporation, Ypsomed AG, Antares Pharma, Inc., West Pharmaceutical Services, Inc., Consort Medical plc, Sensile Medical AG, Owen Mumford Ltd., SHL Group, and Wilhelm Haselmeier GmbH & Co. KG. This report by Transparency Market Research analyses the global self-injection devices market for the period between 2018 and 2026. An in-depth and unbiased market assessment has been made, which offers readers an in-depth and accurate analysis. Market projections have been offered in terms of value (US$ Mn). Stakeholders of this report include companies and intermediaries engaged in research & development, manufacture, and marketing of products prescribed in the treatment of various medical conditions. The global self-injection devices market has been studied for the forecast period from 2018 to 2026. For research, 2017 has been considered as the base year and 2016 as the historical year. The global self-injection devices market report comprises an elaborate executive summary that provides overall information about various segments of the market. The report provides a detailed competitive landscape, by major players operating in this market, along with their shares (value %) of the global self-injection devices market for 2017. The report also provides detailed company profiles of emerging market players operating in the global self-injection devices market. The market overview section comprises impact factors such as key market dynamics, including drivers, restraints, and opportunities, affecting the global self-injection devices market. These factors are likely to aid stakeholders in establishing a strong foothold in the global self-injection devices market. Furthermore, the market overview section comprises key industry events, technological advancements, product portfolio overview of leading players, and market attractiveness analysis in the global self-injection devices market. The market attractiveness analysis provides a graphical view comparing the expansion and market dynamics in various segments and countries to identify the most attractive market. The global self-injection devices market has been segmented based on product, usage, and region. In terms of product, the global market has been classified into pen injectors, autoinjectors, and wearable injectors. Based on usage, the global market has been segmented into disposable and reusable self-injection devices. In terms of region, the global self-injection devices market has been segmented into North America, Europe, Asia Pacific, Latin America, and Middle East & Africa. Moreover, quantitative analysis for major countries such as the U.S., Canada, Germany, France, the U.K., Italy, Spain, China, Japan, India, and Australia & New Zealand has also been provided in the report. A detailed qualitative analysis of factors responsible for driving and restraining the global market in various regions has been provided in this section. The report provides a detailed outline/blueprint of the global self-injection devices market, which is expected to assist new companies establish their presence and existing companies to expand their share in the market. The report concludes with the company profiles section, which includes company overview, financial overview, SWOT analysis, product portfolio, business strategies, and recent developments of key players. Major players operating in the global self-injection devices market include Becton, Dickinson and Company, Gerresheimer AG, Insulet Corporation, Ypsomed AG, Antares Pharma, Inc., West Pharmaceutical Services, Inc., Consort Medical plc, Sensile Medical AG, Owen Mumford Ltd., SHL Group, and Wilhelm Haselmeier GmbH & Co. KG.